As we highlighted in a prior post, when the dollar rallies, companies with domestic exposure tend to outperform their multi-national peers. Since small-cap stocks tend to have little in the way of international exposure, they tend to be a big beneficiary of dollar strength. 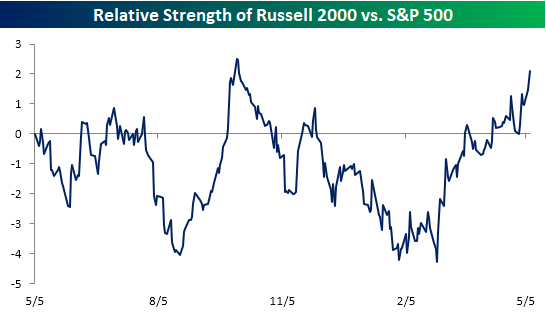 Look no further than the relative strength chart of the Russell 2000 versus the S&P 500 over the last year. When the line is rising, it indicates that small caps are outperforming and vice versa for a falling line. While small caps were underperforming by a pretty sizable margin back in mid-February, they have completely reversed in the last three months and are now outperforming large caps by nearly their widest margin of the last twelve months. Quite a turnaround! In terms of the recent outperformance in the small-cap space since the US Dollar Index’s low in February, it couldn’t possibly be more broad-based. Since 2/16, the S&P 500 is down 2.3% while the S&P 600 small-cap Index has actually rallied 2.7%. 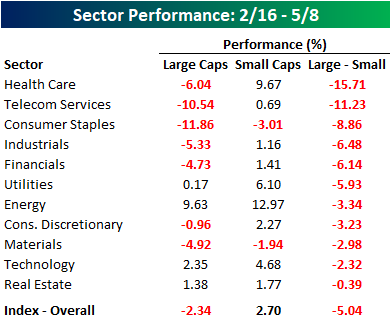 What’s really amazing, though, is that all 11 sectors in the small-cap space have outperformed their large-cap peers since 2/16. While the performance spread is widest in the Health Care sector at more than 15 percentage points, even small-cap Technology and REITs have managed to outperform their larger peers.